Strengthening and Conditioning | Coach Billy. I told them that I now go to the gym and I’m wearing Medium sized clothes. 6 months ago, I was wearing Extra Large. Jessica L. came to me a month before her 53rd birthday. During our initial confession, she confessed that she’s been putting herself in the back-burner, sacrificing her time and energy to take care of her 20-something daughter. She told me that she realized she wasn’t getting any younger. And if she wants to enjoy life with her growing daughter, she has to start taking care of herself, too. Jessica’s goals were to lose weight especially in the tummy area, on top of feeling healthier and fitter in general. She has an active job which sometimes requires her to take ‘double shifts’ working up to 12 hours once in a while. But apart from that, lifting weights was all new to her. We started meeting twice a week on our first month to reinforce this new habit of going to the gym exercising. I gave her an exercise program that she can do on her own for two more days, plus a High-Intensity Interval Training plan for her cardio. She came to the gym whenever she can, up to 6 times in a week! Before her work. After her work. On her off days. Lucky for her, she also has access to a gym in her workplace. So sometimes she does a quick Leg workout (her favorite) at work in the morning, then trains with me at the end of her day. After a couple of weeks or so, we structured her workouts at the gym and at her workplace so that she doesn’t over-train herself quickly. We also had a talk where I told her that although her determination, hard work, and energy was phenomenal, what would really drive her fat loss fast would be to dial in her nutrition. That was when things really start to happen. Through our 3-Day Diet Diary, she realized that 70 to 80% of her food intake was mostly carbs, and she needed to eat more protein, and drink more water. I haven’t seen someone so determined that nothing slows her down, even her favorite foods! Fast forward to today, she’s enjoying a week-long cruise, feeling confident in basking under the sun. Apart from having a stronger core, Jessica has more confidence in herself! she might have ended up fatigued and frustrated. She was CONSISTENT in being active throughout the day. improved her balance, and felt more confident in moving her body. get to and from her workplace. volume of food she’s eating. tweaked her eating to match her goals. about her health and fitness. fitter is worthy enough goals. She claimed that before, she used to just watch T.V. Everyone knows that it’s important to be active, eat healthy, and stay fit no matter what age. But not everyone has the specific strategies and guidance that Jessica had on top of her dedication that produced these stunning results. If you want to get the same strategy and support that Jessica followed to drop dress sizes and feel more confident in her own body, you can start with my 28-Day Group Coaching program and set off the spark to a more confident, vibrant, and fitter you! Unfortunately, that world doesn’t exist. Our schedules get messed up, we get sick, projects take longer than expected, injuries and emergencies happen, and so on. It doesn’t even have to be a negative reason to miss workouts. I have had clients who miss weeks and months of training due to work promotion or because their business is booming, or because they have to welcome a new family member, or simply because they have to go on a nice vacation on a sunny island. There could be numerous reasons for this fantasy checklist to not exist. Sometimes it gets frustrating especially when you were keeping up a pretty impressive routine, then it suddenly had to stop. I know, you want to jump straight to when you left off. You weren’t away for so long anyway, so why not? You may be familiar with the Training Principle called “Progressive Overload” which states that your strength and conditioning increases slowly and gradually as you keep overloading the stimulus (exercise). Well, you may not have heard of the Principle of Reversibility, which as it name implies, means that any adaptation that has taken place as a result of your training will be reversed once you stop training! The speed at which reversibility happens depend on a lot of factors, but even pro-athletes are not exempted! On average, training loss occurs at about one-third the rate of the gains. Some sports skills can be lost in one to two weeks. The good news is, reversibility stops once you get back to training! But the best way is to take the Principle of Progressive Overload into consideration. Start easy but challenging, then go from there. Base strength refers not just to how much your muscles can lift, or how long your heart can keep pumping, but also includes your ligaments, tendons, joints, and bones. These guys take a little longer time to adapt and recover to the stresses of training, and are more subtle. Avoid high-intensity movements that involve a lot of jumping, plyometrics, fast movements, or heavy maximum lifts. If you took the time off because of an injury, you should even be more careful. The longer your break was, the more time you need to give yourself to come back to where you left off. Unless you have an upcoming competition, or a deadline to show your six-pack, you don’t need to rush! Other factors such as fitness level, age, body type, health history, and so on affects the time it will take for you to get back. Remember that exercise is also physical stress to your body, and doing it too much too quickly can cause more harm than good. Make small progressive increments. Consistency is the key to success, and patient hard work pays off. Even elite athletes fall off their training. Life just has its ups and downs. Remember that the goal of your training is to improve your quality of life. If life happens, then so be it. Get back to training and you know that you’ll reap the rewards of a physically active lifestyle in its time. No one is TOO OLD to lift weights. Before anything else, watch this 77-year old woman lift heavier than you do! “I never used the words “I can’t”…I would just say “I will try.” That’s how I lived my life, just trying to do my best – everyday. …I can shovel my own driveway when it snows, thanks to the power-training. …my grandchildren, I can lift them up without any problem. …and the best of all, I don’t need any help when I carry my groceries. Who says you have to stop lifting after hitting a certain age? Willie Murphy, the strong woman on the video, started lifting weights at age 50. One of the largest determinants in quality of life and functional independence is STRENGTH. Unfortunately, a lot of people who were once strong suddenly stop when they hit 70, 60, 50, and some even 40 or younger. – walking, climbing stairs, etc. – sitting down and standing up. – carrying groceries, kids, etc. 3) To lose some weight. I’ve had people who just started going to the gym later in life. I’ve had people who had been active before, maybe played some sports when they were younger, but had an injury or life just happened and stopped, but wanted to get back. It is possible to ‘get back’ to being physically active. It is beneficial to be active and get stronger especially later in life. Just like Willie, always keep a perspective of ‘trying.’ Try to do your best everyday. Try to be better most days. Just try. You will not know what your body is capable of until you try. With proper guidance and training, you can succeed to be better and get stronger, even over 50. Lifting is not just about losing weight, or looking good… it’s about improving your quality of LIFE. Happy New Year to every one! It’s the time of the year again when people get busy starting anew with their fitness goals. Get ahead of the pack and start off with Online Training! Train Smarter this year and reach your fitness goals FASTER. You don’t want to be like a firework: start working out to get fit in January, but quickly fading away the next few months! Trust me, as a Personal Trainer, I’ve seen lots of those. I’ve talked to lots of gym members who seemed pretty motivated at first, optimistic about what they want to achieve, but eventually falling off simply because they didn’t have a plan to follow! What will change after you've achieved these goals? Who or what inspires you to be fitter? Train hard, but train smarter. Talk to you soon! It’s the time of the year for giving! If you have been good the past year with your fitness goals, and have consistently made gains from your training, then don’t miss time to share the gift of fitness. Fitness is not just about abs and arms, but about improving your health and overall quality of life. If you have exercised regularly enough, you probably have felt more energetic, alive, and just happier about life. This is something that you would want your family and friends to have, right? As a Personal Trainer both in-person and online, I know it could be tough most of the time to motivate other people to get into fitness, especially family and friends. But like what I always say, “Consistency is the key to success” and I’m sure eventually they will agree with you and might even come with you to the gym! So start them off by giving them something inspiring and useful this Christmas from my list below that would hopefully get them to think more about their fitness. Maybe you could even get one for yourself! Simply click the links below to lead you to an Amazon page where you can easily order your gifts. Amazon offers FREE SHIPPING for orders over $25.00! 1.) Ab roller – the ab roller is a small but absolutely effective equipment to work the abs. When used properly, it could target not just every muscle of the “core” but also the arms, shoulders,and even legs! I personally like the dual ab roller, because it provides more challenge to shoulder stabilizers and core, but better give a standard uni-wheel ab roller for beginners and intermediate exercisers. 2.) Exercise Bands – yet another small but tough fitness equipment to have, exercise bands are very portable and could be used almost anywhere! There will be no excuse left not to workout with these ones! Exercise bands promote eccentric contraction when used in a controlled manner (vs. jerky, fast movements) which is great for building strength and muscle tone. This is a good choice if the person you’re thinking of giving a gift to is someone who is not confident of their body and overall strength, and needs something simple to get started with. You can also give them an exercise band manual to compete the package. Get the TRX Suspension Trainer Full Workout Kit from Amazon. If the person you’re thinking about is seriously considering committed training whether in the gym or at home, then signing them up for Online Training is the best choice! As a treat, I’m offering a 12-Days til Christmas special: Sign up on or 12-days before December 25 2016 and get a 25% off on any Fitness Coaching Package offered from Fitness Coaching for Me. Simply answer the form on the Services page here, and we’ll get started. Don’t miss the opportunity, sign up NOW! Steven has been training with me on my Online Fitness Coaching program for 8 months now and has improved a lot since we started! He initially wants to lose body fat and gain more muscle mass but upon achieving that goal, he now trains for athleticism and overall fitness. I give him a three to four workout day routine each week that he does in his own pace and time. When he started the Online Fitness Coaching, the routine included a cardio guide, the strengthening or resistance exercises, and some home core workouts. The routine keeps changing and adapting to his progress and now his workout even includes Agility Drills! You see, progress is not only measured by how many pounds you lost, or how much more weight you can lift, but also on how many other stuff you can do — and that is Fitness. My Online Fitness Coaching program provided Steven some serious guidance through periodized training programs that elite athletes follow, but customized to his fitness level, abilities, and schedule. “My trainer, Billy, is an amazing motivator and always challenges me to push my boundaries and strive for excellence bringing me to new heights. Billy quickly identified my strengths and my weaknesses and showed me how i could improve and regain my health. Billy has designed a training program that has made it possible to achieve my goals and consistently pushes me to prove to myself that I can exceed my expectations. He tailors my workouts to my individual goals and needs. Although the workouts can be tough, Billy makes them fun and gets me excited, I dropped from 180lb of mostly fat to 165lb of mostly muscle. – Steven, a Successful Online Fitness Coaching Client. My wife and I have been looking for a short but fun get away this summer. 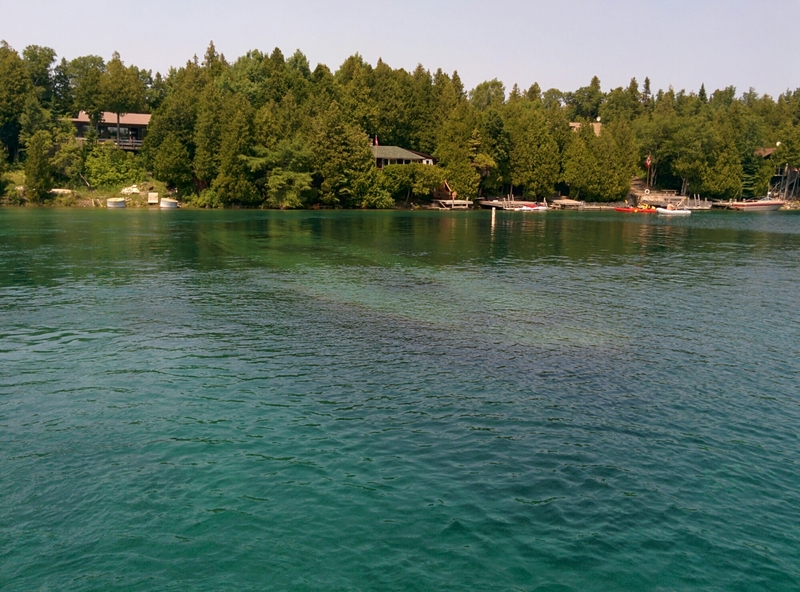 We just came from Niagara-on-the-Lake last Thursday, rested at home for a day, and took a 3-hour road trip to Tobermory and Collingwood last weekend. This time we are hoping for a Fitness filled adventure! Since we didn’t want to drive for four hours, we joined a bus tour under ShengNuo tours. The tour guide translated his script to both English and Chinese at the start but for the most part of the trip, everything was in Chinese. That was fine for us as long as we get in our destinations! He also gave us some flyers that we told us to review so we don’t miss out. 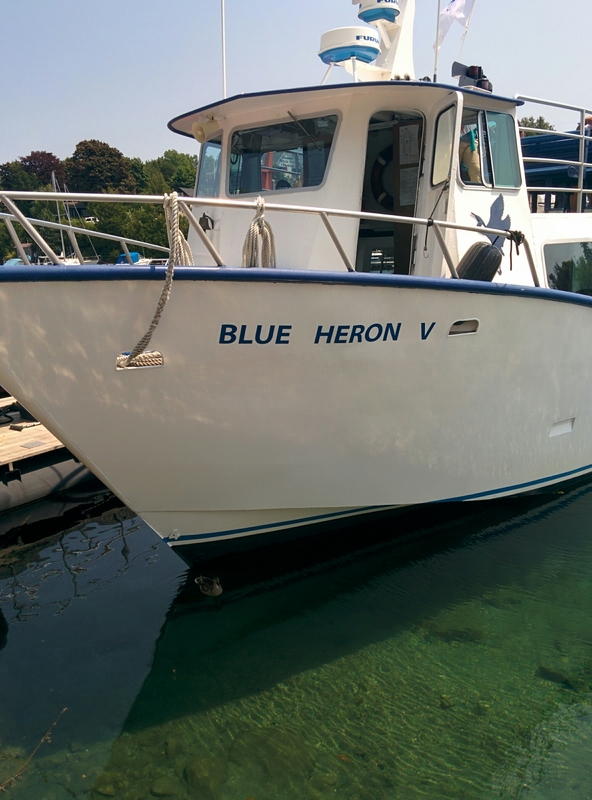 We went to ride the Glass Bottom Boat Cruise to Flowerpot Island on our first day after a long 3-hour ride. On the way to the island we spent around 15 minutes at a shipwreck. The boat had a small section where you can see the Lake floor through the bottom of the ship — don’t expect the whole boat to have a glass bottom! 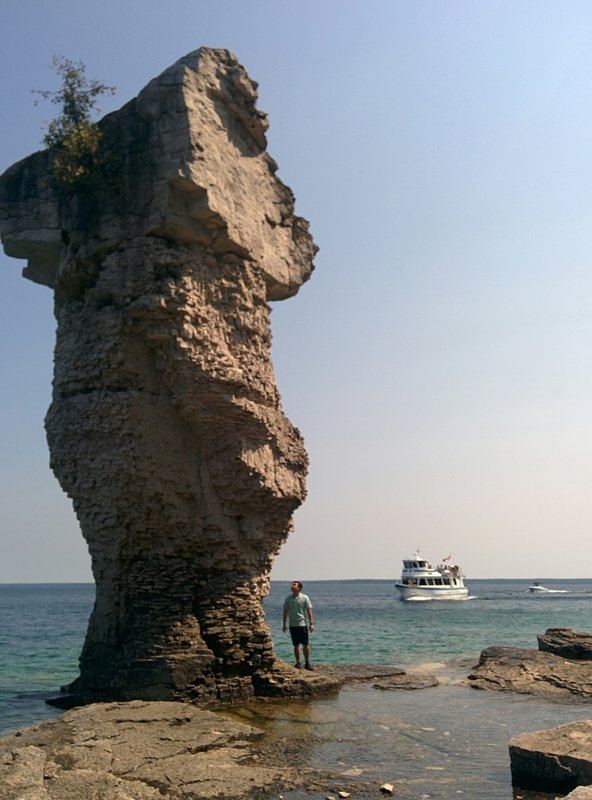 We arrived at the Flowerpot island with just enough time to hike the trail (about 25 minutes one way to the lighthouse), take pictures, hangout and enjoy the scenery. 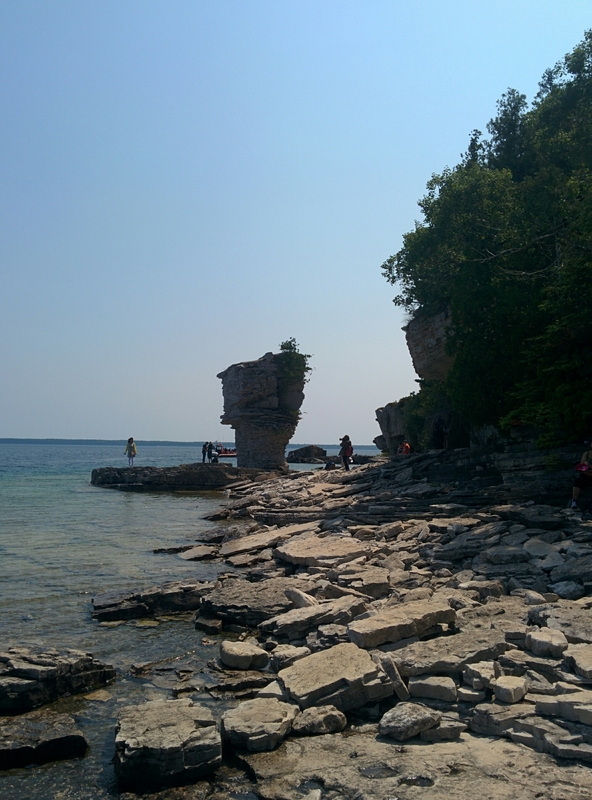 The island was named after two limestone rock formations that is shaped like flower pots. Get your selfie sticks ready for the awesome view! Take amazing pictures with a SELFIE STICK! 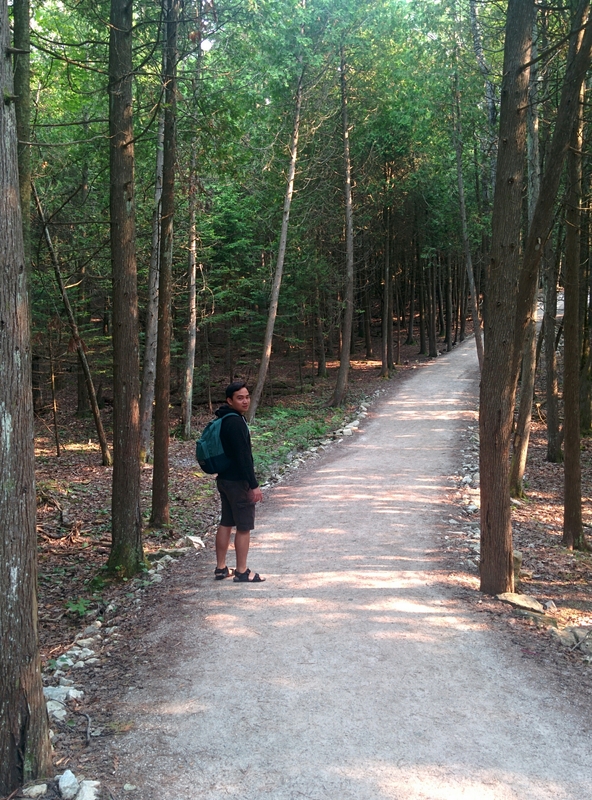 The trail at Flowerpot Island was fairly easy and it’s something the whole family can enjoy. Both kids and even the elderly can follow the trail up to the lighthouse. There are some areas which are very rocky and some requires climbing up a rock, but there are lots of friendlier shortcuts. If you’re planning to wade in the water make sure you bring a pair of swim shoes as the smooth rocks on the floor of the Lake can be very slippery. It was also breezy cold when we went (at around 23C) and we only saw a few people who dared to swim. Before approaching the lighthouse, there is a cave that can be climbed easily through steep wooden stairs. You’ll get rewarded by a majestic view of the green canopy over the island that merges with the fresh blue lake. We spent a few hours in the island before taking the jet boat back to the port, so we went to our 3 other destinations the day after. We first visited the Inglis Falls – we thought our tour guide made a mistake because we knew it was the Owen Sounds Falls, but he was right! It was named after the Inglis family who owned a factory in the area. There was not so much to see apart from the Falls and we spent only 15 minutes in that location. There is a 10km river trail available that we didn’t go through because it was not in our itinerary. Also there’s a lot of big mosquitoes in this area because of the stagnant river water near the dam so be prepared especially if you go there with kids. The BuzzBarrier Insect and Mosquito Repellant Wristband is perfect for this occasion — no more hassle of applying lotions to your kids, they just have to wear the wristband and have fun! 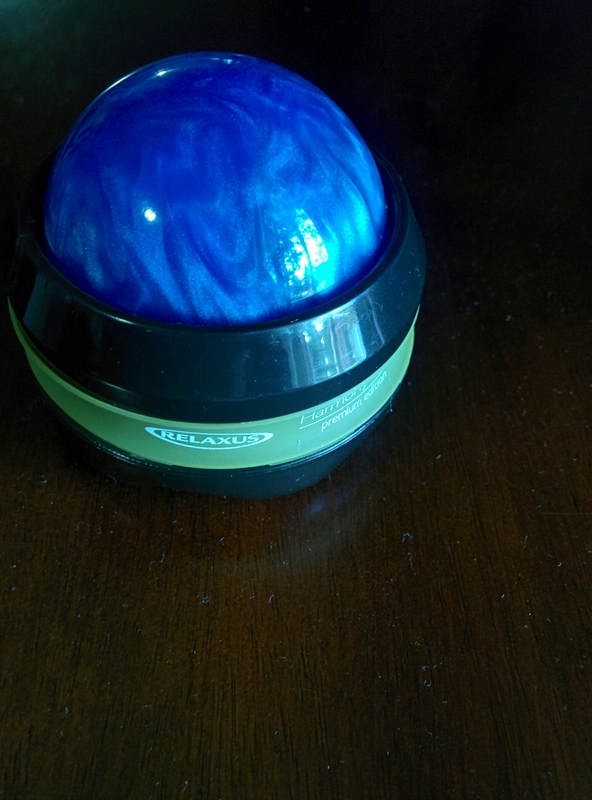 Get your Mosquito Repellant Wristband here. Next stop was the Georgian Bay trail. 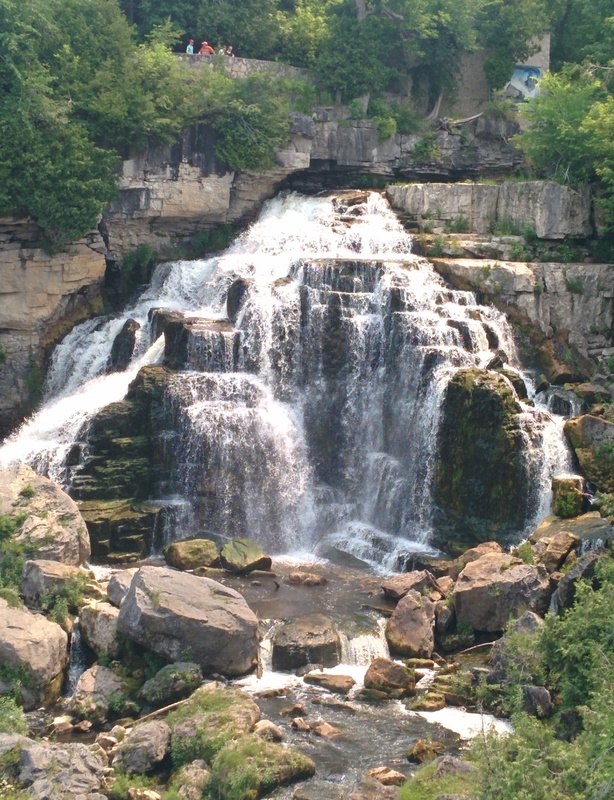 This is another spot that you might not want to miss at the Bruce Peninsula. It’s included in UNESCO’s list of nature reserves which means that you’ll see nature’s pure beauty and wonder. Get your cameras ready for this one! There are a lot of trail options available but since we have one more destination (and we have a few seniors with us), we took the shortest route. 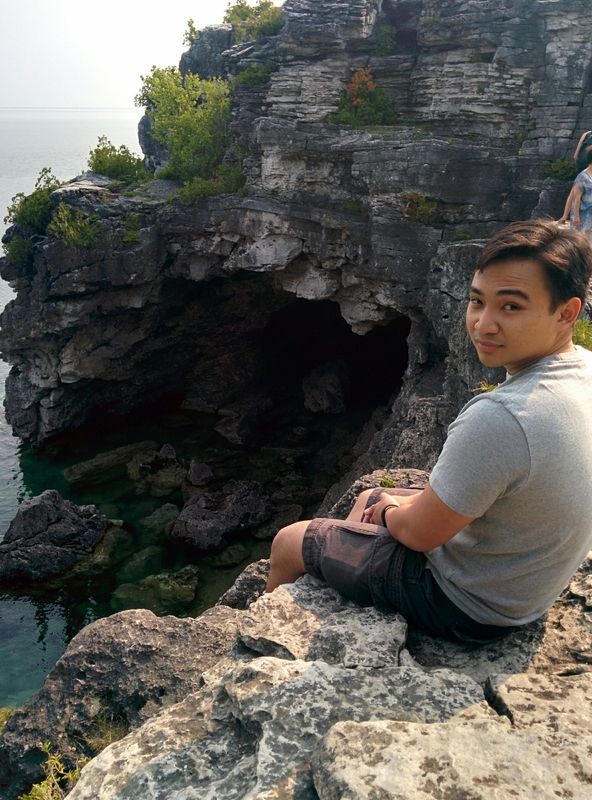 It took an easy 40 minute hike to reach the Georgian Bay and a few more minutes with some rocky climbs, you’ll reach the Grotto. 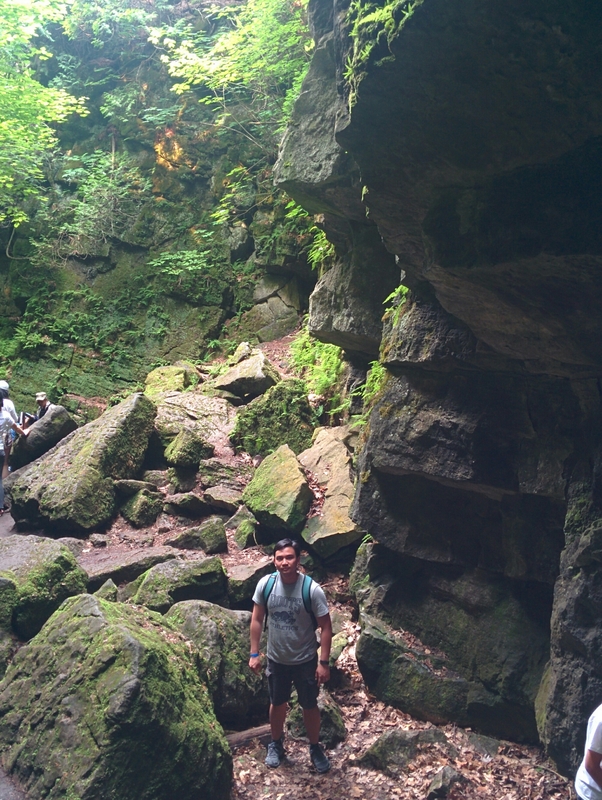 The Grotto is another rock formation shaped like a cave from years of erosion. Stretch your tired back, legs, and feet while you enjoy nature’s wonder. It is highly recommended to check this place out! Last stop, but definitely not the least! We went to Scenic Caves Adventure resort. It’s a big compound that encloses a nature trail and mountain hike featuring the Caves, a panoramic view of the bay from the longest suspension bridge, an adventure play area for kids, and a lot more! This was the longest and may be the hardest trail of our weekend. It involves a lot of steep climbs and a few slippery rocks. You’ll surely feel your Heart Rate go up a dozen notch! (Need a Heart Rate Monitor when you workout?) You’ll be rewarded with an awesome experience so get ready to hike! Be a PRO Adventurer with GoPro! This adventure trail is best captured with a handy GoPro. Get your GoPro from Amazon here. All in all, my Fitbit Charge registered 16,905 steps. Scenic Caves is still designed to be enjoyed by the family and there are stairs and occasional rail handles. If you have any heart conditions this might not be for you as the steep climb could really boost your heart rate. Elderly people who have difficulty walking can stay in the Souvenir Shop or by the man-made lake. After a two long days of hiking, we just felt like getting a massage to release those tightened trigger points in our sore muscles. And guess what, we found this gem from the Scenic Caves! It’s the Relaxus Harmony Roller — an innovative tool for self myofascial release for your neck pain, tight shoulders, sore legs and back. It’s easier to use on smaller areas of your body like your neck and shoulders and is more portable than the foam roller. 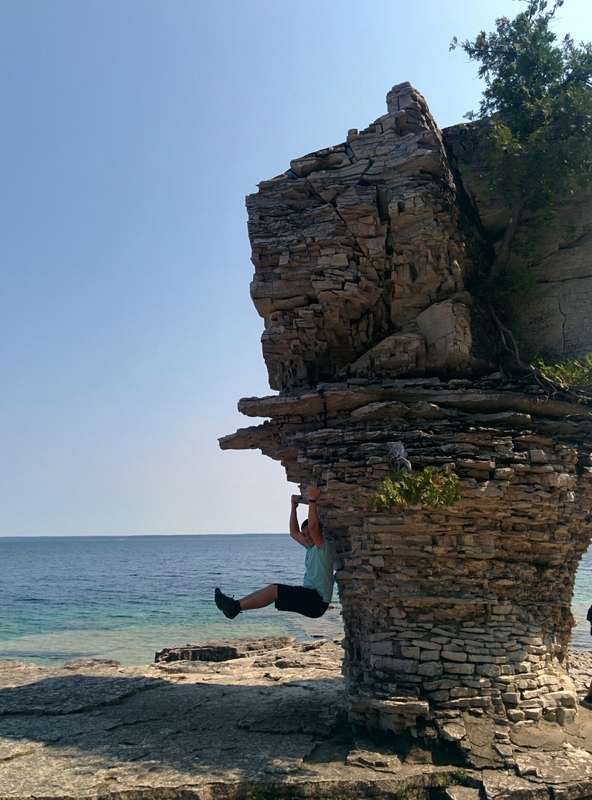 Going to the Flowerpot Island, Georgian Bay, and Scenic Caves was absolutely worth it and a must try if you’re looking for a family friendly adventure!